H1 Zinc gains almost match Silver. Oil and Gas strong too. While this website primarily covers the precious metals we diverge on occasion into other commodities and in this respect our concentration on price gains in gold and silver in particular have meant we have missed the big recoveries in some other metal and mineral commodity sectors too. 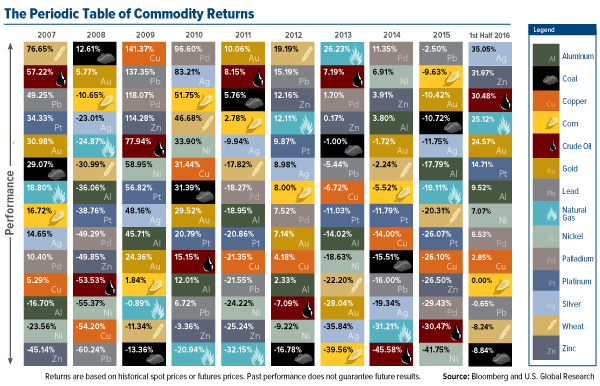 Indeed it took Frank Holmes’ review, and his ‘periodic table’ of H1 commodity performance to show how well some of these have been performing almost as well as silver – still the H1 leader in price gains – over the first half of the year. In actuality it is almost certainly a case of these commodities being heavily oversold in last year’s big downturns, but it is worth noting that invariably such downturns are overdone with momentum carrying prices down way below levels justified by the true supply/demand equation. The H1 ‘Periodic table’ shown above from U.S. Global Investors shows in no uncertain terms how volatile the sector can be over the years with the top and bottom performers switching around almost on an annual basis. And what it shows for H1 2016 is that although silver was, as we have noted beforehand, the top performer to date with an H1 price rise of 35%, zinc put on nearly as much at 32%, with oil and gas (hugely oversold last year) knocking gold into only 5th place with respective gains of 30%, 25% and 24.5%. 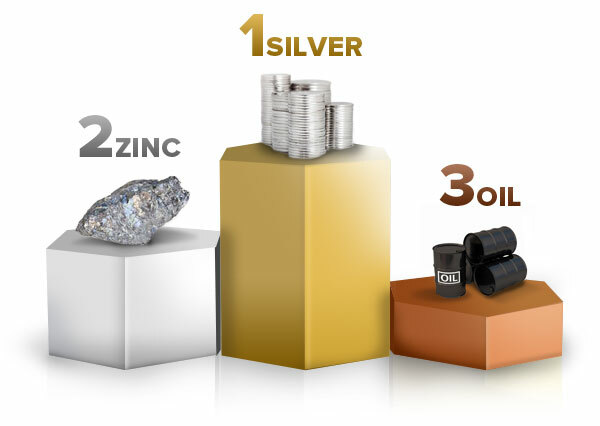 Zinc does have additional relevance in a focus which is primarily on precious metals as most primary silver producers also mine zinc (and lead) in relatively large quantities as well with the three metals invariably occurring together. So the rise in zinc prices will have had an additional booster effect on the fortunes of most of the primary silver producers. 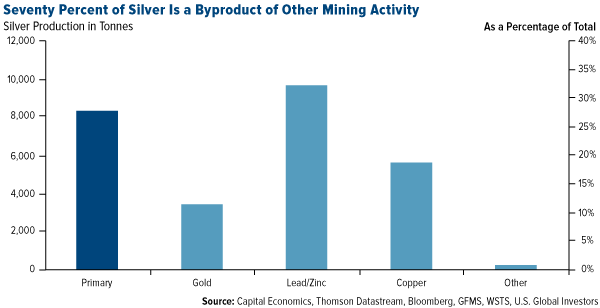 Similarly most primary zinc mines will also be producing silver as a byproduct. Indeed the supply/demand situation for zinc has caused many commodity analysts to tip zinc and zinc miners as having strong investment potential over the past few years, but until this year the metal has not performed as the analysts had predicted. Their premise had been one on likely major disruptions in the supply/demand balance with two of the world’s biggest zinc mining operations coming to the ends of their profitable lives, and no major new producers coming on line to replace what was assumed would be a significant supply shortfall. In retrospect the Chinese industrial downturn threw some of the demand parameters into disarray and last year, for instance, zinc was one of the worst performing commodities, falling in price over the year by around 26.5%. As Holmes pointed out in his accompanying article – Silver Takes the Gold: Commodities Halftime Report 2016 – this dynamic certainly helped boost the zinc price so far this year. He noted that during the first four months of the year, mine production fell 8.1% from the same time a year earlier due to declines in Australia, India, Peru and Ireland. The straw which may have finally broken the camel’s back was that Vedanta Resources made its last zinc shipment from its Lisheen Mine in Ireland, which for the last 17 years had produced an average 300,000 tonnes of zinc and 38,000 tonnes of lead concentrate per year. This has been coupled with an expected increase in the demand the demand for refined zinc expected to increase 3.5% this year. A large percentage of this growth can be attributed to China, which is still investing heavily in infrastructure, even as money supply growth has slowed. 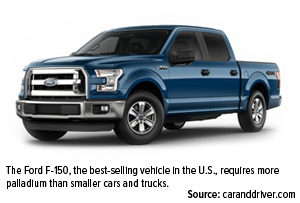 But the other big factor has probably been record automobile sales in the U.S. and China, the world’s largest automobile market, recording the sale of 10.7 million vehicles in the first five months of the year – an impressive year-over-year increase of 7%. Much as the precious metals complex tends to be dragged up by movement in the gold price, natural gas tends to benefit from movement in crude oil prices which probably accounts for gains here, although again the decline in fracking activity in the U.S. on economic grounds given the low gas prices will not have hindered here. 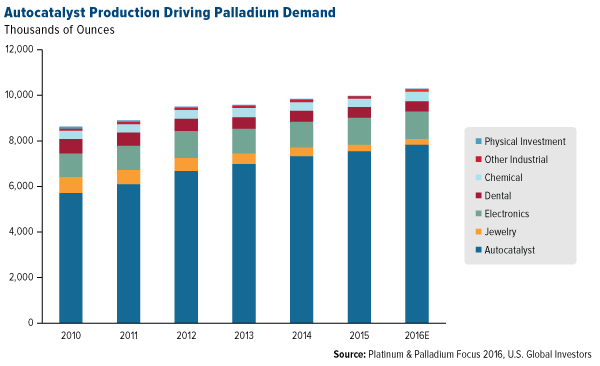 The other sector worth commenting on here has been a decent rise in pgm prices – of platinum in particular, although palladium, – continually pushed by the analysts as being the likely best performer in the precious metals complex has continued to underperform relative to its peers. In H1 platinum was up 14.7% and palladium only 6.5%. Both should perhaps have been boosted by the strong automobile sales figures in particular, while some supply disruptions in South Africa will also have contributed. Both metals are expected to see a supply deficit this year, but the pricing situation is continuing to be undermined due to large stocks of both metals being held out there and possible liquidations out of ETfs. So while precious metals continue to be the focus of much commodity and equity investment interest, it is worth keeping an eye on some of what might be considered the more mundane metals and minerals. Like the precious metals, many of these have perhaps been oversold in the downturn years and others could be set for similar big rises. It’s a question of getting one’s timing right to benefit from these gains. Copper, nickel and lead have been laggards in any pick-up so far this year and coal remains hugely depressed. Could we see a turnaround in any of these? At some stage we probably will as low prices impact supply and, in most cases, annual demand continues to grow. As noted above timing is everything in commodity investment. Fans of ‘liberty’ cheered for Farage and for Brexit. And, after the sharp recovery in equity indexes around the world, it looks like stock investors have begun cheering as well. Many say stock market losses sustained in the first couple of trading days were an overreaction. Maybe. Or maybe not. In news that was largely overlooked, EU officials just granted a $150 billion emergency bailout measurefor Italian banks who are drowning in bad debt. Italian officials used the panic around Brexit and fear of a run on their banks to lobby for the special accommodation. Portuguese banks aren’t in much better shape. 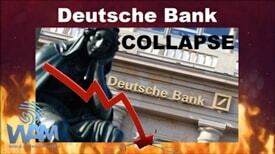 Then there is Germany’s Deutsche Bank (NYSE:DB). Last week the IMF hammered DB in a report labeling the troubled German firm as theriskiest financial institution in the world. 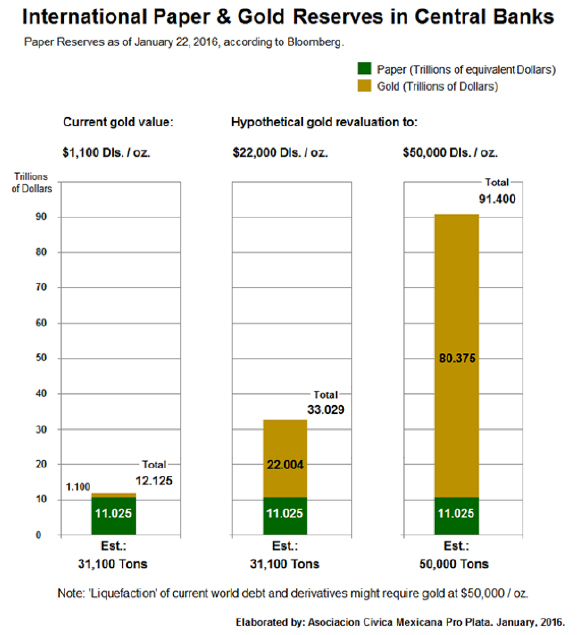 DB holds something on the order of $70 trillion dollars in notional value of derivatives exposure. It also carries lots of “non-performing” loans. A Classic Case of Failed Socialism: What’s Next After the Brexit? 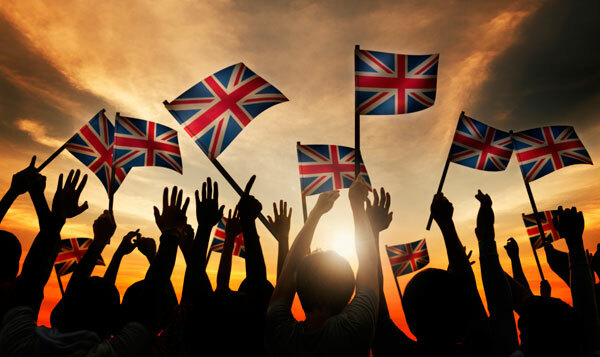 Defying sentiment polls leading up to last week’s historic Brexit referendum, British voters said “thanks, but no thanks” to excessive EU taxation and regulation, choosing to take back Britain’s sovereignty in financing, budgeting, immigration policy and other areas essential to a nation’s self-identity. It was a momentous victory for the “leave” camp, led by former London mayor Boris Johnson and U.K. 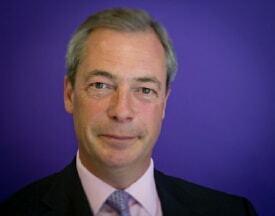 Independence Party leader Nigel Farage, who invoked the 1990s sci-fi action film “Independence Day” by declaring June 23 “our independence day” from foreign rule. As I’ve been saying the last couple of weeks, British citizens and businesses have grown fed up with an avalanche of failed socialist rules and regulations from Brussels, responsible for bringing growth and innovation to a grinding halt. Even if the referendum had gone the other way, it should still have served as a wake-up call to the European Union’s unelected bureaucratic dictators. Euroscepticism and populist movements are gathering momentum in EU countries from Italy to France to Sweden, and the week before last, fiercely independent Switzerland, which voted against joining the EU in the 1990s, finally yanked its membership application for good. Britain’s decision to leave exposes the fragility of trade right now and mounting apprehension toward globalization. The EU is mired in tepid growth, and the blame cannot be pinned on immigrants, as some have tried to do. Instead, Brussels’ policies are anti-growth. Moore’s Law says the number of transistors in a microchip doubles every two years. That’s just a fact. American entrepreneurs embrace and indeed push the limits of technological innovation, but “Eurocrats,” to a large extent, seem to be in open opposition to it. This is why many large, successful American tech firms such as Facebook and Google are treated with such hostility in Europe. The bureaucrats are so against growth and prosperity, it wouldn’t surprise me if they tried to do away with Moore’s Law. Immediately after results were announced, the British pound sterling, one of the world’s reserve currencies, collapsed spectacularly against the dollar, plunging to levels not seen since Margaret Thatcher’s administration. The euro, the world’s only fiat currency without a country, fell more than 2 percent. Gold, meanwhile, screamed past $1,300 an ounce to hit a two-year high, proving again that the yellow metal is sound money and fervently sought by investors worldwide as a safe haven during times of economic and political uncertainty. Uncertainty is indeed the order of the day. As the World Gold Council (WGC) put it on Friday, “It is difficult to find an event to compare this to.” Trading blocs have fractured before, but none as large and significant as the EU. As the world’s fourth most liquid currency, gold saw massive trading volumes. At the Shanghai Gold Exchange, an all-time record amount of gold was traded following the Brexit—the equivalent of 143 tonnes in all. “We expect to see strong and sustained inflows into the gold market, driven by the intense market uncertainty that now faces the global markets,” the WGC wrote. 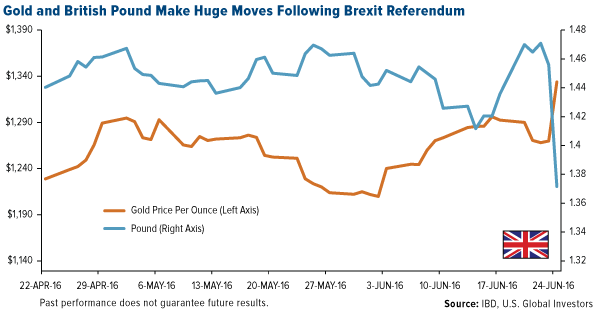 The Brexit lifted not just bullion but gold stocks as well, with many of them climbing to fresh highs. Shares of Barrick Gold shot up 10 percent in early-morning trading while Yamana Gold and Newmont Mining both saw gains of over 8 percent. I’ve always advocated a 10 percent weighting in gold—5 percent in physical gold, 5 percent in gold stocks—with rebalancing done on a quarterly basis. Gold is now up at least one standard deviation for the 60-day period, meaning now might be a good time to take some profits and rebalance. It’s been a spectacular six months! As I said, global growth is unstable, especially in the EU, and the Brexit will only add to the instability. This will likely continue to be the case in the short and intermediate terms as markets digest the implications of the U.K.’s historic exit. It should be noted that the country will remain a member of the EU for two more years, during which time the nature of the relationship following the official divorce can be negotiated. These negotiations will take place without David Cameron, who unexpectedly announced early Friday morning that he was stepping down as prime minister. The results of the referendum also call into question the unity of the kingdom itself. England and Wales both voted to leave the European bloc while Scotland and Northern Ireland were aligned in their desire to remain members. The best performing precious metal for the week was palladium, rising 2.24 percent. Palladium surged early in the week, doing just the opposite of gold, when polls indicated British voters were more likely to vote “remain” in the Brexit referendum, thus economic uncertainty would be maintained. However, the palladium price dropped on Friday as gold soared to a two-year high following the U.K.’s vote to exit the European Union, boosting haven demand. According to Bloomberg, U.K. voters backed leaving the EU by 52 percent to 48 percent, causing turmoil across markets and prompting Prime Minister David Cameron to resign. Gold dealers in London say they have never seen anything like it, describing the rush from consumers to sell gold, and many more to buy the precious metal following the U.K.’s vote to exit the EU. “We’re doing 10 times the business we normally do,” said Michael Cooper, commercial director of ATS Bullion Ltd. BullionVault saw its busiest day ever on Friday, reports Bloomberg. Despite the surge in gold prices on Friday following the U.K. vote, it was the worst performing precious metal for the week, although still up 1.43 percent. Gold backed ETFs have seen a surge in assets this year as investors have started to discount that political leaders at the central banks around the world have lost their mojo, as you can see in the chart below. Gold experienced weakness most of the week, falling for the first four days of the week as polls on the Brexit referendum showed uneven results. Gold tumbled by the most in almost a month as other polls on Monday showed voters tilting toward remaining in the EU. Kinross Gold Corp. temporarily halted mining at its Tasiast mine in Mauritania, reports Bloomberg, after the Ministry of Labor banned some of its expatriate workers from the site due to invalid work permits. The stoppage comes a week after a three-week strike by unionized workers ended at the mine, one Seeking Alpha article points out. According to the median of 12 forecasts in a Bloomberg survey of analysts and traders from New York to Canada, gold prices could reach as high as $1,424 an ounce by year end, reports Bloomberg. 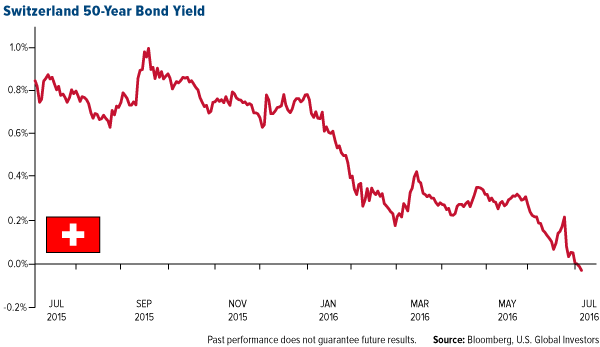 “The Brexit referendum lowered the probability for an interest rate hike,” said commodity analyst Thorsten Proettel. Low rates are a boon to gold because it increases the metal’s appeal as a store of value, the article continues..
Capital spending by gold producers has been decimated, writes Sean Gilmartin at Bloomberg, which will lead to a long-term decline in the mine supply of the metal. According to UBS, high quality gold equities still offer attractive leverage to gold price upside, and will outperform physical gold in a rising price environment. 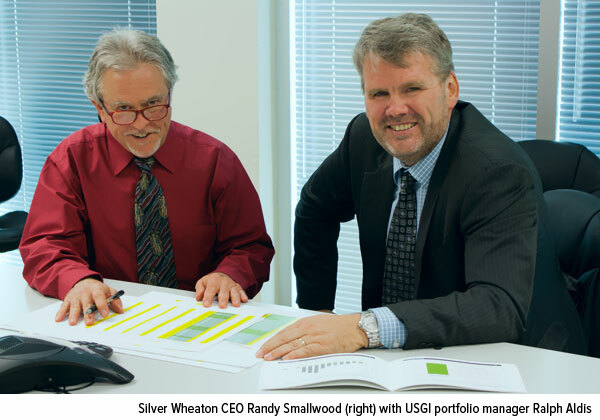 Other opportunities for the metal come in the mergers and acquisitions space, reports the Financial Review, particularly in the West African-focused gold space driven by strong acquirers out of North America. In an all-share deal, Teranga Gold made an offer to buy Gryphon Minerals, boosting its share price by 22 percent on the news. Physical demand for gold out of both India and China was tepid during the first half of the year, reports Bloomberg. Demand was historically weak in India, with the discount averaging $25 an ounce in 1H versus $8 a year ago. Also contributing to the overall weakness was a poor farming year in India, continues the article, yielding less disposable income for Indians to buy gold. Although a vote for Brexit will benefit gold, reports SocGen, other commodities such as copper and oil could suffer. Mark Keenan, SocGen Asia head of commodities, points out that a rising U.S. dollar will depress metals such as copper, and risk aversion may hurt oil. In a note from Sovereign Man this week, the author reflects on how much has changed since the publication started seven years ago. He points out that U.S. government debt soared 70 percent, that the Federal Reserve’s balance sheet more than doubled, and that the U.S. government has been caught red-handed spying on everyone – all in seven years’ time. “We’ve seen an appalling rise in police violence and Civil Asset Forfeiture to the point that the U.S. government now steals more than every thief in America combined,” he continues. Perhaps Donald Trump is right in that Mexico will pay to build a wall on its northern border, which is to keep Americans from crossing illegally into Mexico. Should the platinum:gold ratio be traded as it hits extremes? We often cite the gold: silver ratio as an indicator for the precious metals markets. When the ratio is high (gold is relatively strong versus silver), that typically corresponds with a cyclical low area in precious metals prices. When the ratio starts narrowing (silver gains strength versus gold), that typically corresponds with a cyclical bull market in precious metals. The gold:silver ratio hit a multi-year high of over 83:1 earlier this year. It has since come down to 73.4:1, as of Friday’s close, as silver has gained strength in this year’s rally. On a historical basis, silver remains a relative bargain compared to gold. The ratio has much further to fall in a major bull market. Another important ratio is that of gold to platinum. To gauge whether platinum is trading at a premium or discount to gold, we can simply reverse the ratio. This year platinum traded at its deepest discount to gold since 1982. The platinum:gold ratio currently comes in at 0.8:1, meaning an ounce of platinum sells for 80% of what an ounce of gold commands. As a general rule of thumb, platinum is a great bargain when it sells for less than gold. 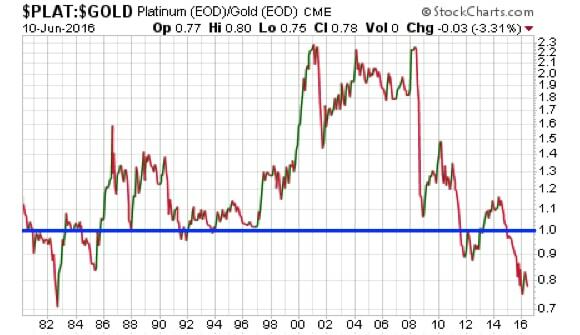 As the chart shows, the platinum:gold ratio periodically gets drawn back like a magnet to price equilibrium at 1.0. It’s not a law that platinum must return to equilibrium with the gold price or spend more time than not exceeding it. It just happens to be a strong tendency supported by sound fundamental reasons, including platinum’s supply scarcity. When platinum’s discount gets to a multi-decade extreme, as it is now essentially, then precious metals investors have an incentive not only to favor platinum over gold – but to trade out of gold for platinum. We certainly don’t recommend giving up a core position in gold. Gold has unique qualities as the ultimate, most recognized form of money. However, for those who have accumulated an outsized position in gold and hold little or no platinum, now may be an opportune time to trade some gold for some platinum. Let’s assume you wind up getting an exact even exchange of 10 gold ounces for 12 platinum ounces. Three years later, the ratio has risen from 0.8 to 1.2, around the historical average. Gold now trades at $2,000/oz and platinum 1.2 times that at $2,400. The ten gold ounces you sold would be worth $20,000. The 12 platinum ounces you bought are now worth $28,800. Thus, trading the platinum to gold ratio boosted your precious metals wealth by 44%! This hypothetical should not be interpreted as a prediction of future price outcomes. It’s merely an illustration of one type of scenario that could play out. The latest announcement from China’s Shanghai Gold Exchange (SGE) shows that gold withdrawals for April totalled 171.4 tonnes so remain subdued compared with the past couple of years. For the first four months of the year 687.3 tonnes were withdrawn, very sharply below the 820.6 tonnes at this stage a year earlier (admittedly a record year) – representing a fall of over 19% year on year. 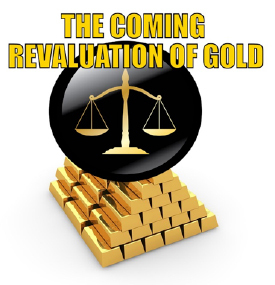 However, even at the current lower monthly rate taken out over the full year this would suggest SGE withdrawals remaining at over 2,000 tonnes for the full year Thus even at a lower level Chinese gold demand as represented by SGE withdrawals – although there are some arguments from top analysts that these overstate the nation’s true absorption of physical gold – do account for a very significant proportion of the world’s newly mined supply of gold – currently around 3,200 tonnes a year. Indian gold imports have also been low in the first four months – initially due to demand being held back ahead of the late February budget in the hope of a reduction in import duties – and subsequently due to strike action by the jewellery sector disappointed that the duty cuts were not forthcoming. Thus the recent performance of gold, given what has been a strong downturn in Asian demand, has been all the more remarkable. To a significant extent growth in Western demand, represented by purchases into the major gold ETFs and strong buying of gold coins and investment bars has been making up a lot of the shortfall from Asia. The biggest of the gold ETFs, SPDR Gold Shares (GLD) for example, has added around 192 tonnes of gold so far this year alone. It is still hugely below its peak, but is currently back at a level last seen in December 2013 with holdings at the end of last week at 834.19 tonnes. It has put on 30 tonnes since the end of April. And according to Bloomberg i inflows into all the gold ETFs it follows totalled around 330 tonnes in Q1 alone. It thus looks as though ETF inflows are taking up any slack represebted by what is very probably a temporary downturn in Asian demand and gold flows. The other contributor to the strong price performance in terms of logistics rather than just sentiment is that physical gold actually appears to be in relatively short supply with available inventories falling in the USA and the UK, where most is held. The head of one of Switzerland’s largest gold refineries recently told Jim Rickards of problems in securing sufficient supplies to meet demand. With new mined gold supply almost certainly plateauing, and possibly even beginning to turn down, demand shortages could be exacerbated further. A recent analysis by Paul Mylchreest, who many may remember as the author of the sadly missed Thunder Road Report also even suggests that the London Bullion Market may even be in deficit. by Ross Norman – CEO Sharps Pixley Ltd.
During 1Q16, physical demand for gold declined 23.8% compared to 1Q15 according to GFMS (1025 tonnes Vs 781 tonnes) yet gold prices rallied 22% – res ipsa loquitur. Gold’s gain year-to-date is impressive – not to say exceptional – and gold bugs will heave a sigh of relief that it has behaved as it should in the face of what is clearly a vulnerable, even fragile macroeconomic outlook. However 2014 and 2015 saw similar rallies before momentum fade set in after Q1 in both years and hence not surprisingly confidence remains light, particularly in view of the size able 45% correction since 2011. Yes, gold has seen a similar price action, but the drivers are not the same. The key physical gold markets in China and India are comparatively speaking absent and the erstwhile seller – the West – has turned buyer. This is not a question of geography, but of motivation, form and tenure. The correction lower from all time highs at $1922 in 2011 were driven by selling across the spectrum of the gold community in the West. 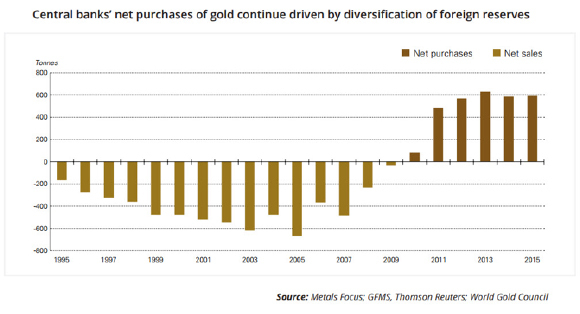 European Central banks had already disgorged sizeable chunks of metal under the Washington Accord and then it was instititutional investors selling of ETFs (roughly 1000 tonnes), coupled by speculators on COMEX who sold their long futures positions and the market went into a rare net short position – and then there was cash-for-gold at the retail end – not in itself significant in size, but it underscored the West falling out of love with gold and cashing it in to sustain the consumption binge of the early 2000’s. Never before was there such an epic movement of bullion from West to East in exchange for fripperies since the days of Marco Polo and the silk road. This year on COMEX we have seen a battle royal between the longs and the shorts with the former winning out. The short covering has played a key role in taking the market through key technical levels and net longs stand at close to record highs. This should leave gold bulls – especially contrarians like myself – feeling distinctly uncomfortable. Meanwhile ETF flows have risen at record pace adding 330 tonnes in Q1 (compared to just 36 tonnes in Q1 2015). Now it could be argued that ETFs are paper or physical – this is irrelevant – what matters is how they behave and as we saw since 2011 these players can operate with the same short termism as speculators and rapidly reverse their positions. In short neither can be entirely trusted. Meanwhile Indian buyers are absent as its government behaves as if it was at war with its gold community (and 3,000 years of history) through punitive taxes ; the market remains lacklustre with prices at a 2 1/2 year high in local terms and is not much helped by a poor monsoon and therefore harvest. The Chinese and indeed Russians meanwhile seem content to pick metal up on any price correction (more traditionally the Indian style) and not chasing the market higher – price supportive, but not a driver. GFMS reports that physical purchases for 1Q16 declined in India by nearly 65% compared to 1Q15. So what has changed. There is growing perception in the West that Cental Banks may indeed be fallible and that the Keynesian experiment may have run its course – in short, the desire for sound money and by extension a growing concern about the increase in debt to resolve financial crisis is gaining currency. If fear is back in vogue then arguably it may less of a sustainable position then the motivation of many Eastern buyers which is simply as long term store of value. For gold to see a sustained rally it needs to fire on more than one cylinder and physical players need to join the party. This in turn would put bullion onto the radar of institutional investors who are yet to be convinced that it really is an alternative to more traditional asset classes. This could then bring about the price elasticity – or buying on higher prices – that typified the last bull run. Or equally perhaps physical buyers do not turn up to the party in which case the speculators – sometimes described as behaving like 11 year olds high on e-numbers – could get bored and as easily reverse their positions. The best performing precious metal for the week was platinum, up 6.38 percent. Platinum largely moved in sync with gold and silver price changes, but has recently outpaced its counterparts and has now begun to play a significant catch-up trade. The Bank of Japan (BOJ) opted against boosting stimulus this week, in a decision that battered the U.S. dollar and gave gold a surprise lift, reports Bloomberg. The Japanese yen also reacted to the bank’s decision, surging the most since the 2010 stock-market meltdown. On Wednesday, the Federal Reserve left its benchmark rate unchanged too, helping to boost the yellow metal. According to the South China Morning Post, the Chinese Gold and Silver Exchange Society plans to set up a gold vault and office in Qianhai. This will be the biggest in Hong Kong investment in the special economic zone in Shenzhen, reports Bloomberg. Jeremy Wrathall, Investec’s Global Head of Natural Resources, thinks that gold is likely to be the best performer among global metals and minerals for 2016, reports Lawrie Williams. The worst performing precious metal for the week was palladium, still up 3.93 percent, and not far behind the other precious metals (all of which closed in positive territory). Palladium was the best performer in the precious metals group last week, when it closed up 5.99 percent. Commodity exchanges boosted margin requirements on more products, reports Bloomberg, sending stocks in China to the lowest in a month. “The boom in the commodity markets isn’t a good thing for stocks as that will distract some investors and divert money away from the stock market,” said Wu Kan, a fund manager at JK Life Insurance in Shanghai. 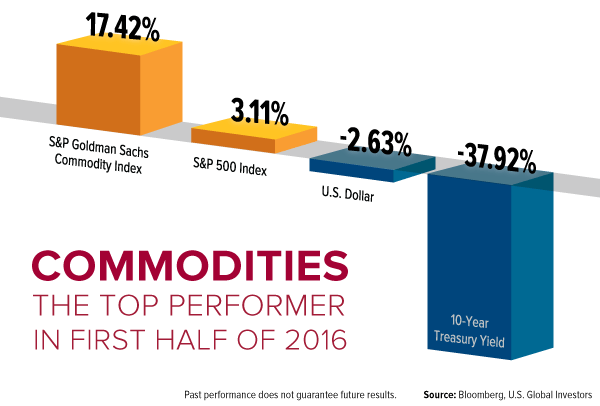 The metals and mining sector is the top performer in both high-grade and high-yield indexes this year, according to BI Senior Credit Analyst Richard Bourke. But has the rally in metals and mining bonds come too far, too fast? An analysis of commodity spot prices shows that they are all above consensus forecast price, and may portend a correction. RBC Capital Markets released a research piece on its gold companies under coverage on Monday, explaining that a decline in production and growth expenditures is expected in 2016. Overall gold production of the North American companies listed in the report, is expected to decline by 7 percent year-over-year. Exploration and expenditure budgets continue to face downward pressure as well, leading to an ongoing decline in reserve lives. While this may appear negative at first glance, the forecast should bode well for acquisition activity to pick up later this year in a heated gold market. HSBC has been bullish on gold since 2015 and the group believes that the strong rally this year could continue. In addition to gold’s inverse relationship with the U.S. dollar, HSBC points out that the group’s counter-consensus view of a strong euro, along with the expectation for the euro-dollar to continue trading higher. Investors may also take a gold position to hedge against the upcoming UK vote to exit European Union membership. 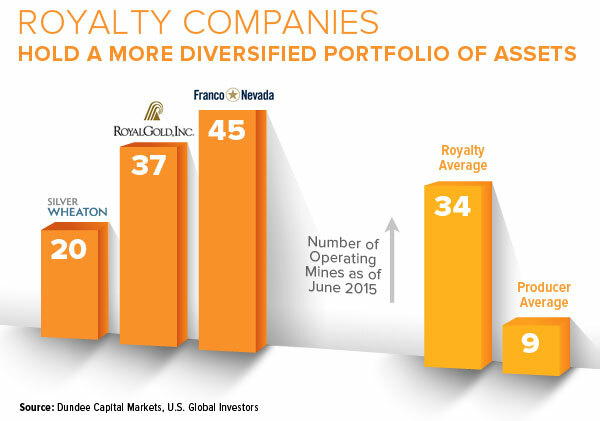 Paradigm Capital released a comprehensive and informative research note this week, focusing on gold equities and opportunities to be found for the generalist. The group highlights negative interest rates and central banks buying gold (rather than selling it) as a few reasons why this up-cycle is different. 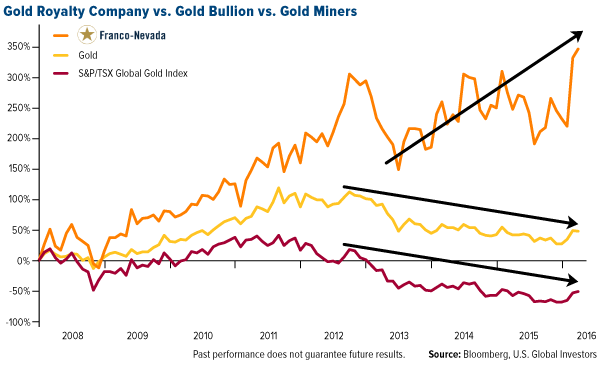 Paradigm also states that “Producing gold is a better business than most today, one with expanding margins, yet gold equities still offer excellent relative value.” In the chart below, this shows the long-term price relationship between gold bullion and gold mining stocks. One can observe that the gold miner valuations are currently substantially depressed relative to the change in gold prices. Could silver’s upswing be due for a correction? Another article from ZeroHedge this week points out that an old indicator, the commitment of traders report (COT), has been a pretty reliable gauge for precious metals’ “short-term trajectory.” However, since speculators are “exuberantly long” silver at this time, this could imply that a correction is coming. Although no one is predicting a heavy fall for precious metals, a commodity specialist from the Industrial and Commercial Bank of China (ICBC Standard) thinks now is probably not the time to buy, reports News Markets. The bank pinpoints an already crowded market for this trade, as speculators have increased their long positions. Our most out-of-consensus call this year is the belief that China, and by extension many emerging markets, will see a cyclical recovery in 2016. We understand the bearish case for emerging markets on a multiyear basis quite well, but we also recognize that in a given year, any stock, sector or region can have a cyclical rebound if the conditions are right. In fact, we’ve already seen leading indicators of economic activity and earnings perk up in 2016 as PMIs have rebounded in many areas of the world. That is all it takes for markets, from equities to CDS, to respond more favorably as overly pessimistic views get rerated. And like in most cyclical recoveries that take place in a regime of structural headwinds, we don’t expect it to last beyond a few quarters. There’s a lot to unpack here, but I’ll say upfront that Cornerstone’s analysis is directly in line with our own, especially where the purchasing managers’ index (PMI) is concerned. China’s March PMI reading, at 49.7, was not only at its highest since February 2015 but it also crossed above its three-month moving average—a clear bullish signal, as I explained in-depth in January. I spend a lot of time talking about the PMI as a forward-looking indicator of commodity prices and economic activity. As money managers, we find it to be far superior to GDP in forecasting market conditions three and six months out. In the past I’ve likened it to the high beams on your car. We were one of the earliest shops to make the connection between PMIs and future conditions, and we continue to be validated. Just last week, J.P.Morgan admitted in its morning note that “stocks are taking their cues from the monthly PMIs,” the manufacturing surveys in particular, as opposed to GDP. We eagerly await China’s April PMI reading and are optimistic that this cyclical recovery has legs. Optimism is strongest among those in higher-tier cities, reflecting the disparity in economic vibrancy across tiers: as many as 80 percent of families in first-tier cities have optimistic outlook. The figure is lower, albeit still strong, at 68 percent among families in the third tier. More than half of those surveyed said they expected to be driving a nicer car and living in a bigger home in the next few years, which is a boon for materials and metals such as platinum and palladium, used in catalytic converters. China’s appetite for metals—gold, silver, copper, iron ore and more—is growing, another sign that the Asian giant is in turnaround mode. China is the world’s largest importer, consumer and producer of gold. Last year, physical delivery from the Shanghai Gold Exchange (SGE) reached a record number of tonnes, more than 90 percent of total global output for 2015. Meanwhile, the People’s Bank of China continues to add to its reserves nearly every month and is now the sixth largest holder of gold—the fifth largest if we don’t include the International Monetary Fund (IMF). As of this month, the bank holds 1,788 tonnes (63 million ounces) of the yellow metal, which amounts to only 2.2 percent of its total foreign reserves, according to calculations by the World Gold Council. Now, in a move that’s sure to boost China’s financial clout in global financial markets even more, the country just introduced a new fix price for gold, one that is denominated in Chinese renminbi (also known as the yuan). Gold is currently priced in U.S. dollars. That’s been the case for a century. But since gold demand has been shifting from West to East, China has desired a larger role in pricing the metal. The Shanghai fix price is designed with that goal in mind. It’s unlikely that Shanghai will usurp New York and London prices any time soon, but over time it will allow China to exert greater control over the price of the commodity it consumes in vaster quantities than any other country. The heightened copper demand has fueled renewed optimisim in the red metal. Prices are up 6 percent month-to-date. Caixin reports that China’s iron ore imports are surging on lower prices. In the first two months of 2016, the country purchased 86 percent more iron than it needs. What’s more, total imports were up 84 percent from the same time last year. Steel production, which requires iron ore, is likewise ramping up. Output is currently at 70.65 million tonnes, an increase of nearly 3 percent year-over-year. For reasons unknown, China has also been growing its silver inventories pretty substantially for the past six months, according to an article shared on Zero Hedge. This month, as of April 19, the Shanghai Futures Exchange added a massive 1,706 tonnes, which is a 452 percent increase from the amount it added in April 2015. Shanghai silver inventories are now at their highest level ever. Though unconfirmed, it’s possible this silver will eventually be used in the production of solar panels, every one of which uses between 15 and 20 grams of the white metal. China is already the world’s largest market for solar energy—it surpassed Germany at the end of last year—with 43.2 gigawatts (GW) of capacity. (By comparison, the U.S. currently has 27.8 GW.) But get this: It plans on adding an additional 143 GW by 2020, which will require a biblical amount of silver. Not to be outdone, India also plans significant expansion to its solar capacity, with a goal of 100 GW by 2022, according to the Indian government. We know that money supply growth can lead to a rise in commodity prices. Note that Chinese money supply peaked in 2010 and has since fallen, along with commodity prices. New bank loans in China have spiked dramatically this year while money supply has grown more than 13 percent year-over-year, which is good for metals and manufacturing. 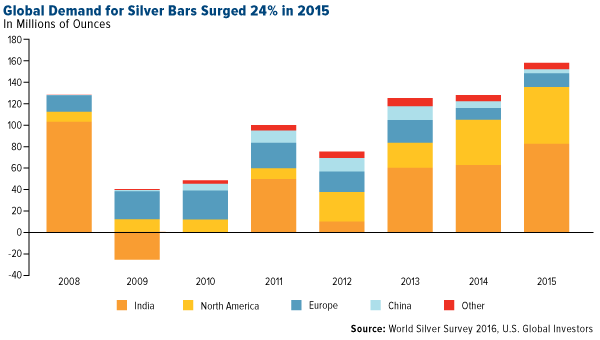 The increase in metals demand, not to mention the weakening of the U.S. dollar, has allowed silver to become the top performing commodity of 2016 after overtaking gold. Despite the rally, gold doesn’t appear to be overbought at this point, based on an oscillator of the last 10 years. We use the 20-day oscillator to gauge an asset’s short-term sentiment. When the reading crosses above two standard deviations, it’s usually considered time to sell. Conversely, when it crosses below negative two standard deviations, it might be a good idea to buy. Silver is currently sitting at 1.2 standard deviations, suggesting a minor correction at this point would be normal. 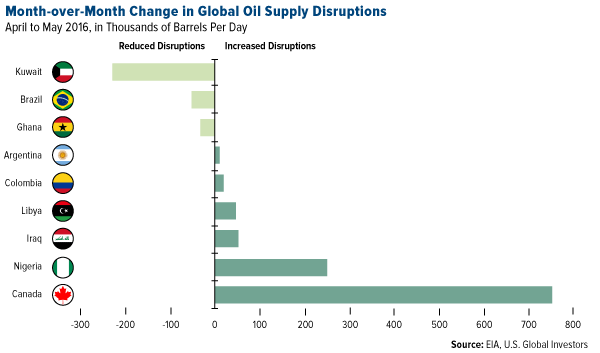 Time to Take Profits in Oil? The rally has been so strong over the past three months that it’s signaling an opportunity to take profits or wait for a correction. Based on the 20-day oscillator, Brent’s up 1.3 standard deviations, which suggests a correction over the next three months. Oil has historically bottomed in January/February. The rally this year has not disappointed. Further, it has helped many domestic banks that have been big lenders to the energy sector. High(er) oil prices translate into stronger cash flows for loans. It was no fun investing in precious metals for most of 2011-2015, but the past few months have sure been a blast for buy-and-hold investors. Silver prices are up 22.5% year to date, and gold isn’t far behind. Now that there are some profits available to take, some metals investors wonder if they should grab them. The answer for most people is not yet — not even close. Yes, there are gains. But the real question for investors isn’t whether or not there are profits, it’s whether there are better options for their investment dollars. 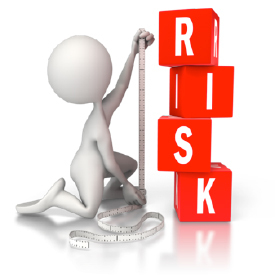 What other assets have a better risk/reward profile? Cash? Stocks? Bonds? No thank you! Central planners at the Federal Reserve and perma-bulls on Wall Street keep telling us the world is fixed, but a whole lot of us aren’t buying it. The focus remains on picking the right safe-haven asset for what promises to be volatile times. Investors might consider the traditional safe-haven alternatives to precious metals – cash and bonds, particularly U.S. Treasuries. Unfortunately, there are no bargains in those markets either. Bond yields are near historic lows, and cash still yields next to nothing. Officials have clearly signaled their preferences when it comes to dealing with these obligations: devalue the dollar and suppress interest rates. This is also known as “financial repression,” a condition where savers are punished with negative real rates of return. If another asset appears better positioned to deliver capital preservation or if the risks to capital fade, it will be time to sell some of your physical gold and silver. For now, the risks are extreme, and most other options look awful. Positive real interest rates. Negative real interest rates (i.e. interest rates that are below the inflation rate) destroy savings. Three-month T-bills currently offer 0.23%. That makes the real interest rate substantially negative, even using the government’s politically manipulated Consumer Price Index (CPI) figure. T-bills and other interest-bearing vehicles won’t be an attractive alternative to physical gold until their real yields turn positive. Mike Bedford of Metals Focus told the European Gold Forum in Zurich of his approach to valuing the major gold mining stocks. Article posted on the seekingalpha.com website. European Gold Forum presentation comes up with a different approach to comparative valuations of Tier 1 gold stocks. 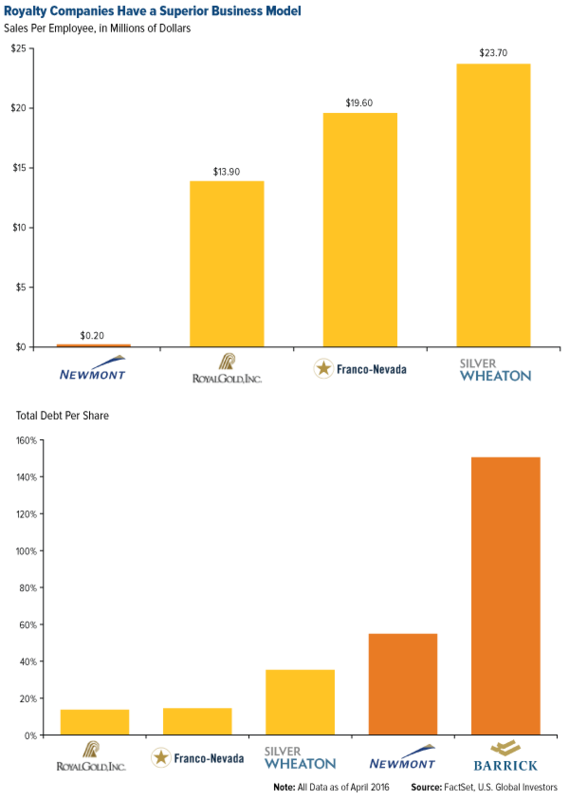 Data from the gold mining majors combined as though they were one massive gold mining company. Metrics for individual stocks can be compared on a case by case basis with a global average.